Those who regard themselves as light users of the iPhone 5 shouldn’t worry too much about battery life, but for the rest of us who might be more demanding, having a sufficient battery charge throughout the day is challenging. Looking around, there are plenty of chargers and cases that deliver some much needed juice on the go, but with the majority of them, they tend to add a lot of bulk to the beloved smartphone. 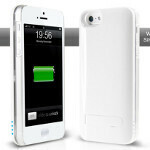 Fortunately, iKit’s NuCharge iPhone 5 case aims to be one of the most versatile cases we’ve come across, seeing that it employs a wide array of useful functions. One part case, personalization is aplenty with it, since there is a variety of Pantone colors available with the streamlined aluminum or leather case covers. Moving onto the juicing aspect of the case, it’s achieved thanks in part to the 1,900 mAh battery pack that’s snapped onto the back of the case covers, which so happens to also incorporate a kickstand for an easy hands-free video watching experience. Unlike some of the competition, the NuCharge doesn’t block access to the iPhone 5’s ports – like its 3.5mm headset jack and Lightning docking port. Therefore, you can still maintain the iPhone 5’s skinny figure with the NuCharge’s fashionable case covers, but at the same time, it doesn’t become a Goliath when the battery pack is attached. As it currently stands, you can support iKit’s NuCharge by putting a $59 pledge through Kickstarter, which nabs you the battery pack and a single Pantone case cover. For $89 though, you can opt to get the limited edition chrome edition cover. ...and make it tick and somewhat ugly? Probably heavier?